Salad Menu - Nightshades—a culprit in common health conditions? Nightshade. The name alone sounds almost ominous. You may have even been told to avoid eating them if you suffer from certain health conditions. But what exactly makes a plant a nightshade, and does scientific research show that removing them from your diet helps with these conditions? It’s worth learning more before you say no to nightshades, a group of plants that includes some of your most commonly consumed foods. After all, if you don’t have to, do you really want to say no to that juicy tomato on your sandwich or the salsa in chips and salsa? Many of you may be familiar with the term nightshade, but may not be aware of the edible plants that fall into this family. They may seem somewhat random. Their fruits, foliage, and flower petals vary widely, as SF Gate notes. Livestrong lists some of the most-eaten nightshade plants—tomatoes, eggplants, potatoes, tomatillos, and peppers are all part of the nightshade family. Interestingly, so is tobacco. What they all have in common is their membership to the Solanaceae family and the genus Solanum. Perhaps the health condition most associated as being worsened by eating nightshades is arthritis, chronic inflammation that can result in painful joints. The Cleveland Clinic recommends cutting back on nightshades if you have arthritis. Did you know that nightshades have also been associated with rashes and the auto-immune condition psoriasis? Healthline asserts that eating nightshades can trigger flare ups of psoriasis, an auto-immune condition. The Be Well blog of Dr. Frank Lipman, a NYC-based doctor who blends Western and alternative medicine, suggests that if you have GERD or digestive issues, you may also benefit from removing nightshades from your diet. Paleoleap gives some glimpse into why nightshades might have earned such a bad reputation. Many of the nightshade plants are poisonous, and particularly the plant belladonna, has been used as a poison historically—even getting a starring role as a poison in MacBeth. SF Gate emphasizes that except for the fruits plants in this family, plant parts contain “powerful alkaloid compounds” that can kill humans and animals if consumed. In fact, United States colonists refused to eat tomatoes until early in the 1800s because they thought they would be poisoned. As with any health recommendation, looking at real scientific research and not just anecdotal evidence can help you make a more informed decision about making any diet changes. As always, first check with your healthcare provider before making any dietary changes. Interestingly, little evidence seems to point to much benefit from removing nightshades from your diet if you are an arthritis sufferer. Harvard Medical School’s Health Publications web site refers to the “unfounded myth” that by not eating nightshades, you can cure your arthritis. It goes on to say that no medical evidence supports this assertion. Similarly, Every Day Health says that while many people with psoriasis believe that eating foods from the nightshade family makes their psoriasis worse, there’s no scientific evidence to back up that belief. The dermatologist interviewed for the article expresses doubt that consuming nightshades worsens psoriasis, but goes on to say that he’s “not opposed to people trying it.” The National Psoriasis Foundation similarly states that there’s scant scientific evidence to back up claims that what you eat and drink can affect psoriasis symptoms—however, it admits that some people have said they’ve experienced some relief from psoriasis through dietary changes. You most likely don’t have to say no to that juicy tomato or the salsa in your chips and salsa if you suffer from arthritis or psoriasis. It seems that there’s really no scientific proof that taking nightshades out of your diet helps with those conditions. With the tomato season soon upon us, that’s good news. After all, that means you can try this Classic Summer Salad. 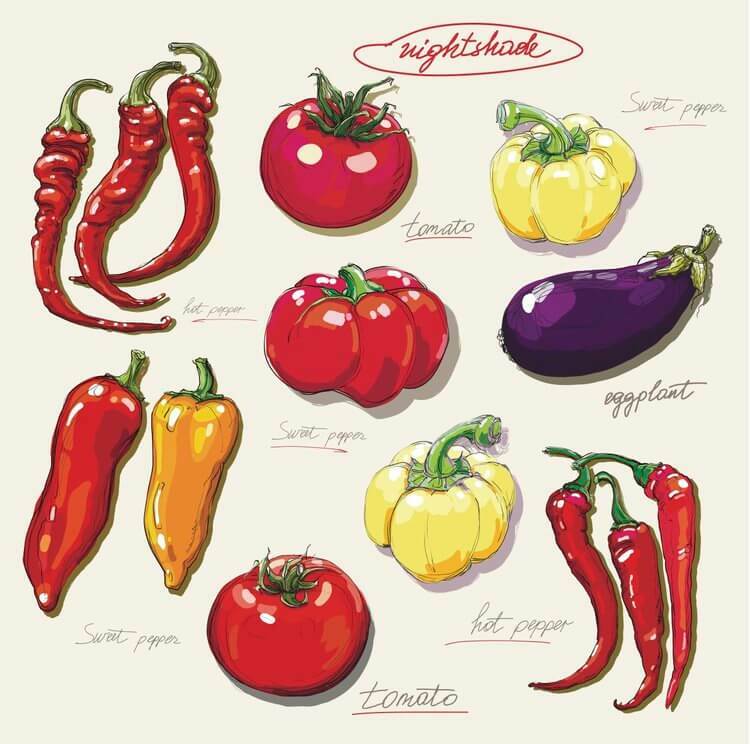 What’s your experience with nightshades? Have you eliminated them from your diet to see if that helps with a health condition? Please share your experience. Nutrition is, as with all fields of study, evolving. And our bodies are all somewhat different. That’s probably why even trusted sources on this topic are quick to say that if a specific dietary change helps you feel better and your healthcare provider has no concerns, do it.